Myripristis violacea Bleeker 1851, the Latticework Soldierfish. Indo-Pacific, to nine inches in length. 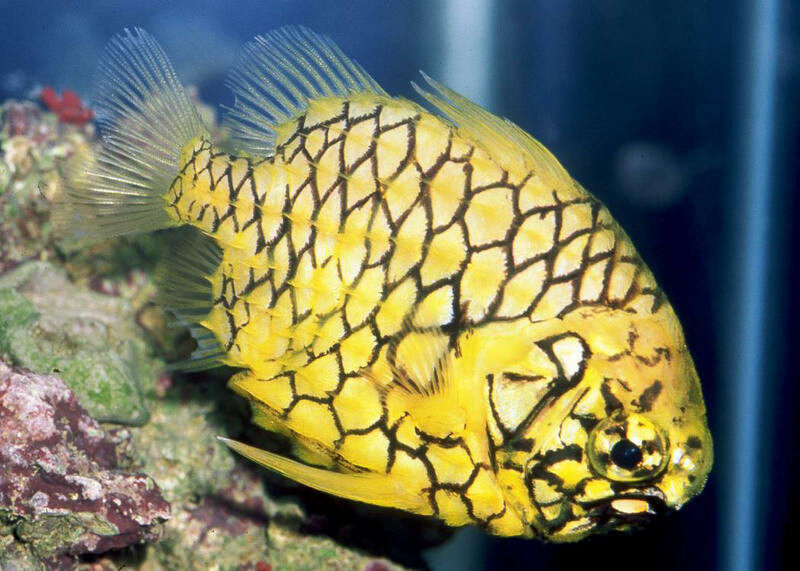 A good-looking smaller species that ought to be more used in the aquarium interest. This one in Fiji. Monocentrus japonicus (Houttuyn 1782), the Pinconefish. To 17 cm. Indo-West Pacific; Red Sea, South Africa to Southern Japan, New Zealand. Found under ledges, in caves at depths of 20 to 200 meters (fishbase). Aquarium photo. 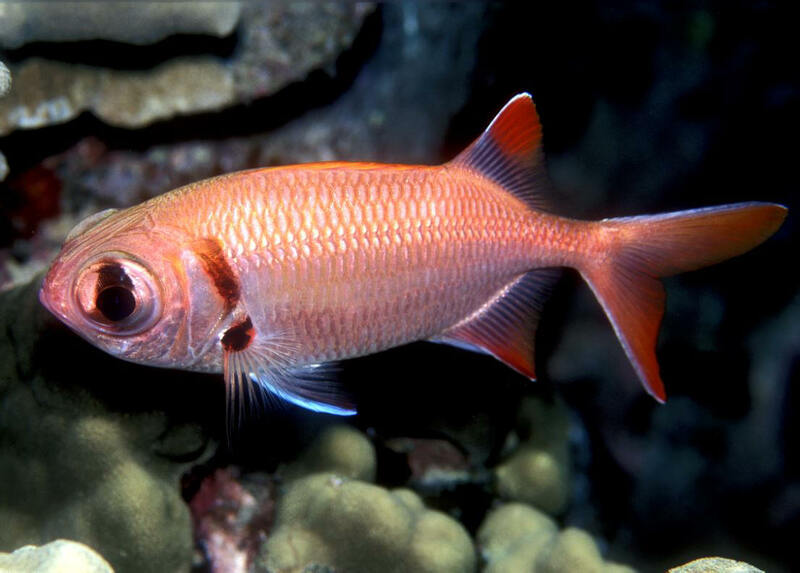 Myripristis adusta Bleeker 1853, the Shadowfin Soldierfish. Widely distributed in the Indo-Pacific. To fourteen inches in length in the wild. Occasionally caught and sold for aquarium use. A more nocturnal species. This one in Wakatobi, S. Sulawesi, Indo. 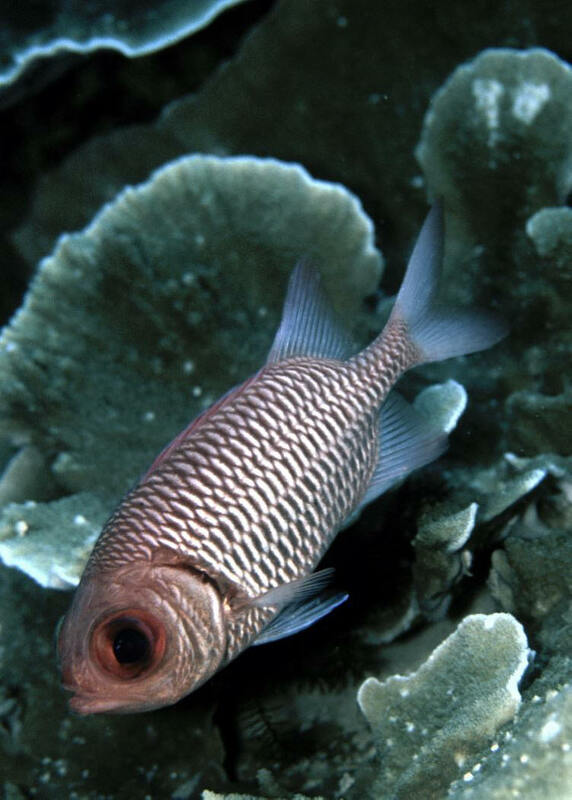 Myripristis kuntee Valenciennes 1831, Shoulder-bar Soldierfish. Indo-Pacific; East Africa to Hawai'i. Two to 55 meters. To eight inches total length. Reef-associated. Leading part of spiny dorsal fin yellowish. One off of Hawai'i's Big Island.